Interested in buying a new pair of binoculars for bird watching? Here are a few things to look for that will help you choose the right one. Nothing is more frustrating than not being able to identify avian species while out in the field. And whether you’re taking aim at the Big Year challenge or just identifying birds in your backyard, you need a dependable set of binoculars that can help recognize even the most subtle characteristics. With these factors in mind, we’ll review some of the best binoculars for bird watching that will serve you well in both observing and identifying your favorite avian species. As an avid birder myself, I’ve come to recognize that binoculars are the easiest way to identify birds quickly and efficiently. Let’s face it, using sounds and calls alone for identification can be extremely difficult and unreliable. Picking the right binoculars for bird watching can help ensure that you see each specimen clearly enough to make the identification with 100% certainty. 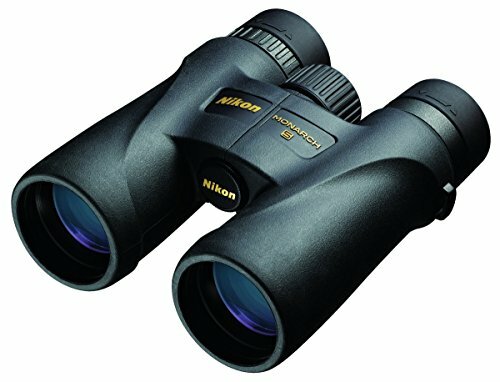 Nikon MONARCH 5 Binoculars (click to check the current price on Amazon) – The Nikon brand has always been my go-to birding binoculars and the Monarch 5’s are what I use currently. The Monarch 5’s are comfortable to wear for long hikes since they are lightweight and the rubber eye cups are soft enough to look through for extended viewing sessions without causing irritation. The lenses are the most crystal clear of any binoculars I’ve ever used. This is my top pick. 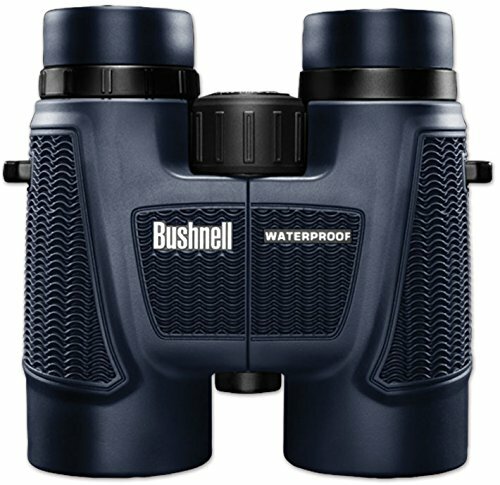 Bushnell H2O Binoculars (click to check the current price on Amazon) – Being exposed to the elements is almost a perquisite for bird watching, and a pair of binoculars like the Bushnell H2O’s is made specifically to repel water. These are the binoculars I use when I don’t feel like taking my Monarch 5’s into bad conditions. The 10X42 magnification is more than enough to identify birds up to half a mile away. Wingspan Optics Spectator Binoculars (click to check the current price on Amazon) – The Wingspan Optics Spectator is a nice compact option if you don’t need the full-sized binoculars like the Monarch 5’s or Bushnell H20’s. It conveniently fits into a small pouch and is handy to carry around just about everywhere. It’s also affordable, so this is your budget option. When you sit down and compare the Nikon MONARCH 5 to the Bushnell H2O Binoculars and Wingspan Optics Spectator the differences are noticeable. The Monarch 5 Binoculars are made with Nikon’s premium Extra-Low Dispersion Glass which is clearer than both the Bushnell H20’s and Wingspan Optics Spectator. The Nikon Monarch 5’s are lightweight at only 1.35 pounds. I’ve carried these on 5 mile hikes and they never became a burden. Monarch 5’s have enlarged and easy to use focus knobs which make focusing on and identifying birds even easier. I have no trouble focusing on fast flying Warblers and Finches with these binoculars. The Nikon Monarchs come with flip down eye caps that help protect the lenses when not in use. The 10x magnification lets you see birds 10x closer. This makes even birds at close to half a mile away identifiable. The Nikon Monarch 5 binocular has a rubber outer shell that provides grip even in wet conditions. The Monarch 5’s provide excellent eye relief for long periods of viewing. Even with eye glasses, they don’t cause irritation. The Nikon Monarch 5’s come with a soft carry pouch that can be carried over your shoulder or around your neck for easy access. Here is a great clip of what you can expect to achieve with a good pair of binoculars for bird watching. Magnification of at least 8x to 10X. Binoculars with a 10X magnification have performed the best for me while bird watching. Lightweight binoculars are easier to carry on long bird watching trips and won’t put as much strain on your arms when viewing birds. 1.5lbs or less is ideal. Crystal clear lenses make identifying birds and picking up small characteristics easier. Lenses like those in the Nikon Monarch 5’s have allowed me to identify birds that I would never have been able to with lesser quality binoculars. Comfortable carrying straps. The best binoculars for bird watching have padded neck straps which allow for comfortable extended viewing periods. Lens caps are a must have item for lens protection. I’ve owned several pairs of binoculars without lens caps and they have all developed scratches on the lenses over time. Soft rubber eye cups are the best defense against eye irritation and provide the best eye relief for long bird watching sessions. User-friendly focus knobs. The best bird watching binoculars have a focus adjustment centrally located. This allows for easy adjustments while staying on target. Durable outer armor and extra grip. Binoculars like the Bushnell H20’s are made with water tight seals for all weather protection. 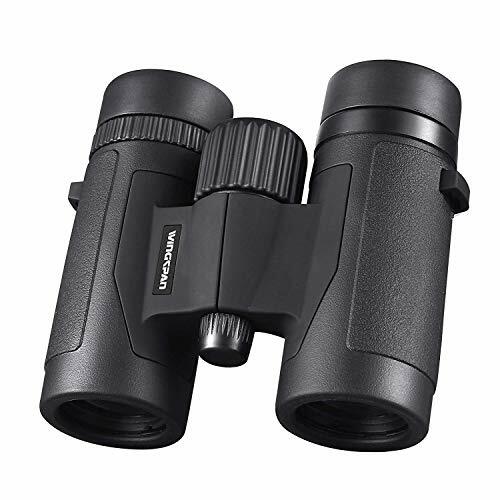 Grooved ridges and rubber grips help ensure the binoculars won’t slip out of your hands. A good set of binoculars for bird watching are an essential item to be as productive as you can be in the field. It only takes one missed opportunity to realize how important it is to have a quality pair of binoculars. Two of most common types of binoculars are compact and non-compact. Let’s take a look at which you should choose. Compact Binoculars – Compact binoculars are designed for people on the go and make a great choice for birding trips that require a lot of hiking and walking. Compact binoculars are built on small frames that can fit into most pockets for easy storage and typically weight less than a pound. Non-Compact Binoculars – Non-compact binoculars are built on large frames and are often twice the size of their compact cousins. Non-compact binoculars can weigh up to 3lbs which makes them difficult and cumbersome for long walks. However, they do offer the best magnification and best long range bird watching you can find. Compact binoculars usually offer the best value for casual bird watching enthusiasts. Not only are they lightweight and easy to carry just about anywhere, they are less of a burden for holding up to your face for long periods of time. For a beginner, compact is the way to go. Non-compact binoculars are more expensive and cumbersome, but they offer the best platform for expert bird watchers and long range identification. Their magnification is often 10x or 12x which most compact binoculars just can’t match. I consider the Nikon Monarch 5’s to be at the transition between compact and non-compact. They are both lightweight and have the capabilities of some of the larger binoculars in both field of view and zoom capabilities. When choosing your next pair of binoculars for bird watching, keep these considerations in mind. In 2015, I set off on the Big Year challenge in hopes of identifying as many bird species as I could in North America. When the year ended, I had recorded over 400 species and learned a lot of things along the way. The first thing I learned was the importance of a good pair of binoculars. This may seem like common sense, but it’s more than just looking at the price of binoculars and thinking what’s expensive must be the best choice. I spent week’s field testing different brands of binoculars to finally narrow them all down to a setup I felt comfortable using for an entire year of bird watching. At the time I settled on a nice pair of Nikon Monarchs. This set of binoculars worked EXTREMLEY well and paired with a good spotting scope allowed me to set my personal record of over 400 bird species identified for the year. If you’re serious about bird watching, this is why picking a quality pair of binoculars is so important.